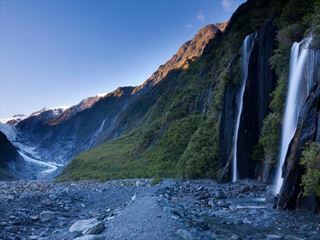 Venture through the diverse landscape of New Zealand with this 17-day tour, taking you on an exciting journey from Auckland to Christchurch. With picturesque train journeys, scenic ferry rides and amazing city escapes, this exhilarating experience offers up a wealth of memorable moments. From the exceptional natural sights of the Doubtful Sound to the opportunity to get an adrenalin rush in Queenstown, every destination visited on this exciting tour is a fantastic example of New Zealand’s diversity. 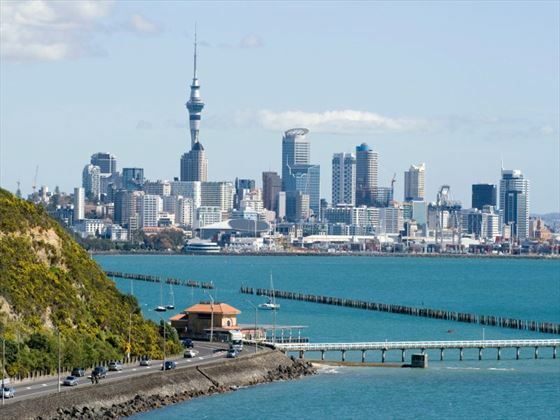 Arrive into Auckland and transfer to your hotel. You will receive a tour pack from your representative which will include all of the required documentation for your trip, including your itinerary and driving instructions. The remainder of the day can be spent exploring Auckland for yourself, from the charming harbors to Ponsonby Road’s great range of restaurants and shops. Today is at leisure to enjoy the delights of the city, with its extraordinary blend of cultures, urban sprawl and beautiful vistas. Visit the Waitemata harbor and enjoy the breath-taking views of the city that it provides, or take a ferry trip to Rangitoto Island. The surrounding landscape is dominated by 48 volcanic cones which create a unique topography and excellent viewpoints for admiring the scenery. A city sights tour is highly recommended to ensure you visit as many of the top attractions as you can while you’re here. In the evening, why not opt for a harbor cruise dinner for a unique experience and a chance to enjoy the city at night? 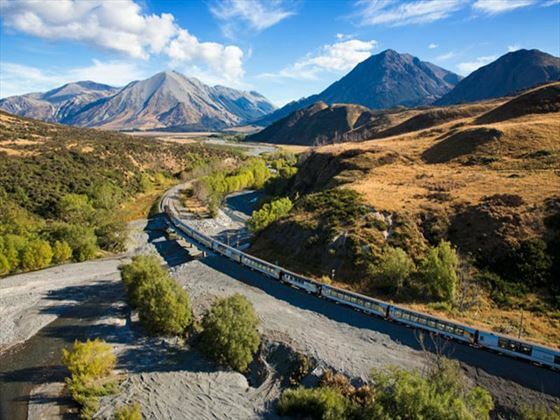 Embark on a scenic rail journey from Auckland to Wellington, passing the beautiful landscape along the way. Along the way you’ll pass the Central North Island ski towns of National Park and Ohakune, as well as witnessing the beauty of the farmlands, volcanic plateau and the world-famous Raurimu Spiral. The Observation Carriage offers up spectacular views for a truly unique experience. Spend the day in Wellington today, visiting some of the many museums that the city has to offer. Take a trip to Te Papa, considered to be the ‘museum of New Zealand’ and translating as ‘Our Place’. This fascinating museum is brimming with arts and culture and offers a glimpse into New Zealand’s past. Alternatively, head to the Museum of Wellington City and Sea for a chance to learn about the city’s culture and social history. If you’re curious about the wildlife, take a seal coast safari trip where you’ll traverse the landscape in search of the New Zealand fur seals. 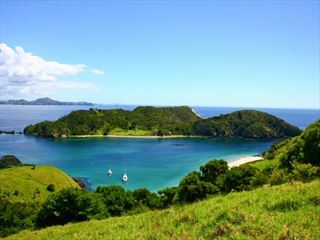 Take the Interislander ferry to Picton which is one of the most scenic routes in the world, taking around three hours to complete. The ferry ride passes many points of interest, including the Pencarrow Head where the oldest lighthouse in the country sits, Oterangi Bay and the Cook Strait. 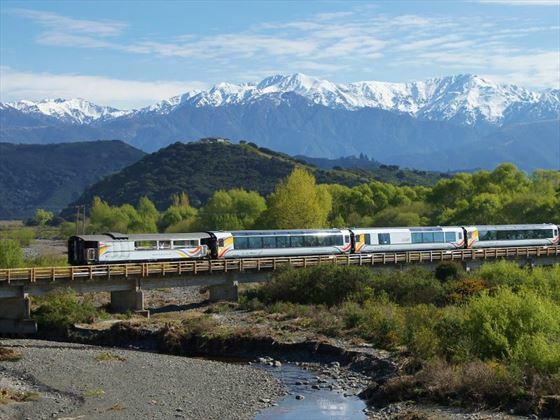 Upon arrival into Picton, take the Coastal Pacific train where you’ll journey past the Kaikoura mountain ranges and the Pacific Ocean, beautiful horticultural regions and lush farmlands. The train features an open-air viewing carriage for a unique travel experience. Today sees you board a luxury coach for a guided tour of Christchurch where you’ll have the chance to see the beautiful gardens and parks, and seaside suburbs. The tour also ticks off four of the top attractions including Punting on the Avon, the Caterpillar Botanic Gardens tour, the Christchurch Gondola and a hop-on-hop-off ticket to see the heritage Tram. Pick up your hire car and journey into the heart of the South Island, crossing the famous Canterbury Plains and stopping en-route at Geraldine before making your way into the Mackenzie Country. After ascending Burkes Pass, you’ll find yourself in the high country where you’ll have the opportunity to visit Lake Tekapo and Lake Pukaki. 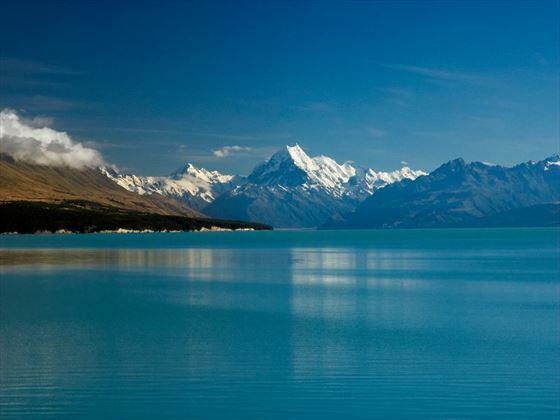 After enjoying the picturesque views, continue along the lake to Mt Cook Village. There are numerous ways to make the most of this area, from ski planes to helicopter glacier landings or kayaking. A 4WD tour is a great way to see the sights, including the Tasman Glacier and the scenic flora. Travel past Twizel as you leave the park this morning, which is the location for many scenes in the Lord of the Rings films. Head into the Waitaki Valley from Omarama and venture east towards the town of Oamaru which is famed for its white stone buildings. Watch the blue penguins come ashore at dusk from the harbor then visit the world-renowned Moeraki Boulders further south. 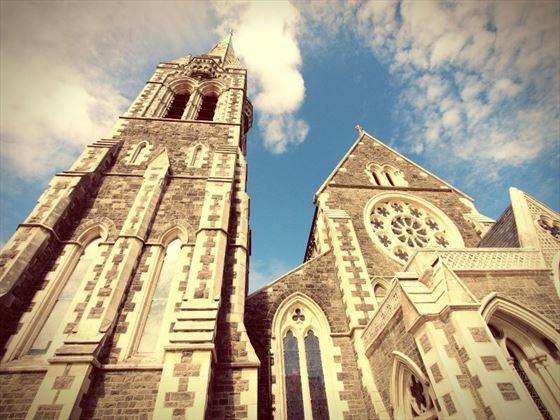 Upon arrival into Dunedin, you’ll be met with charming architecture which is reminiscent of the city’s Edwardian and Scottish heritage. The Taieri Gorge train is a prestige rail service operating from the historic railway station in Dunedin, taking passengers on a journey through the Taieri River Gorge and tunnels carved more than 100 years ago. We recommend take a tour of the Speights Brewery which was founded in 1876 and boasts a rich heritage. 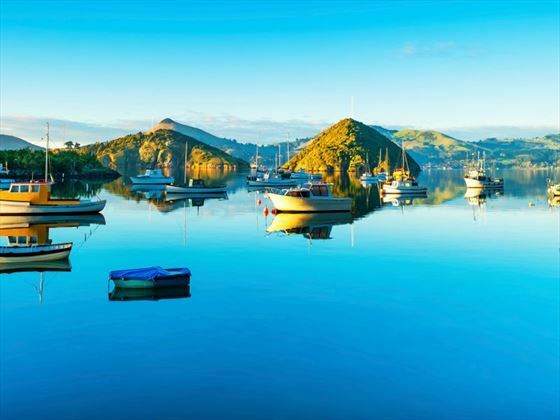 Traverse the charming Southland farmland scenery today as you make your way to Te Anau; alternatively, you could take the Southern Scenic Route which takes you through The Catlins area, along the Otago coastline and on to Invercargill. From here, head north to Manapouri where you can then embark on a day or overnight cruise to Doubtful Sound. 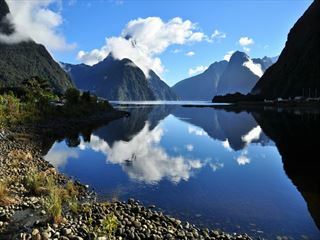 If you’d prefer, a little further onwards takes you to Fiordland National Park and Milford Sound. 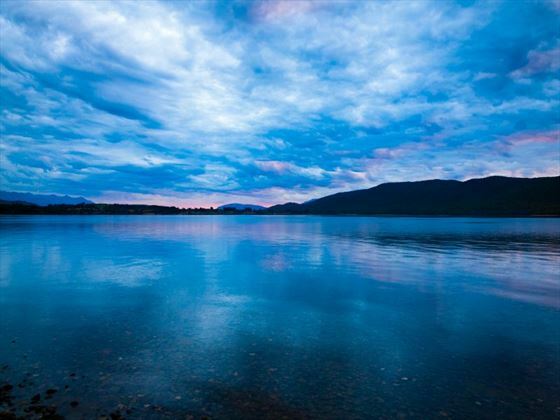 Take a short drive to Manapouri which is the gateway to Doubtful Sound. Embark on an overnight cruise on the Fiordland Navigator for a unique dining experience and the opportunity to experience the breath-taking wilderness at night. The wildlife sightings from this vessel are outstanding, with sightings of dolphins, fur seals and even rare penguins in certain seasons all visible from the cruise ship. Cross the tussock lands through Mossburn and continue north towards Lake Wakatipu. 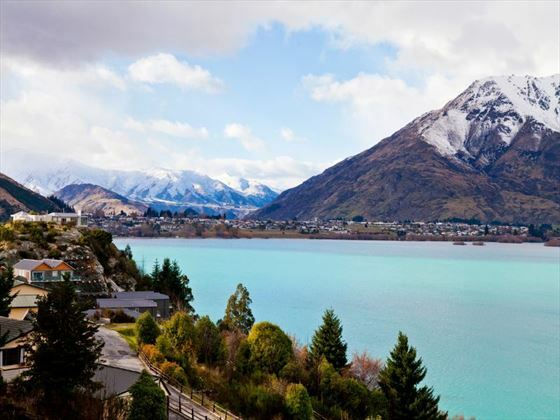 Journey along the lake edge and be met with the awe-inspiring Remarkables mountain range as you enter Queenstown – the adventure capital of the world. Explore Queenstown today and make the most of its many adrenalin-inducing activities, from skydiving to bungee jumping and kayaking. If you want something more laid-back, why not visit some of the surrounding wineries or explore the history gold mining regions in the vicinity. Take a trip on the vintage TSS Earnslaw steamship to Walter Peak Station where you can enjoy an authentic high country sheep farming experience or a farmhouse dinner. The Skyline Gondola offers up spectacular views of the city and is also the steepest cable car lift in the Southern Hemisphere! In the evening, enjoy a return scenic cruise from Queenstown to Walter Peak High Country Farm for a tour of the gardens and a delicious gourmet BBQ using local ingredients. Cross the Crown Range this morning to the alpine town of Wanaka which serves as the gateway to Mt Aspiring National Park. 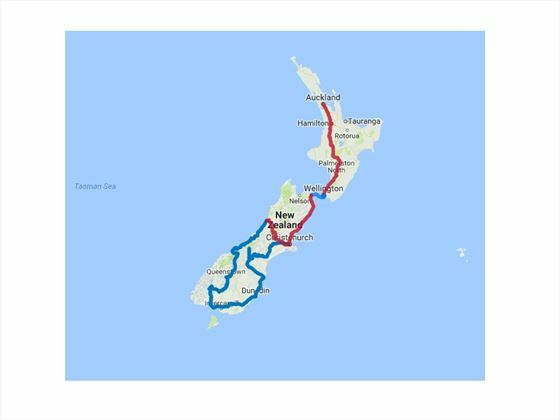 The route you’ll be taking ventures along the shores of the Lakes Wanaka and Hawea before reaching the village of Makarora. Just outside of the village you’ll find the Blue Pools which are a wonderful 30 minute walk through the native beech forests, offering up beautiful surrounding scenery. Drive towards the Haast Pass and make your way into the West Coast, where you’ll journey through a 600km stretch of rainforests, bushlands and podocarp forests. 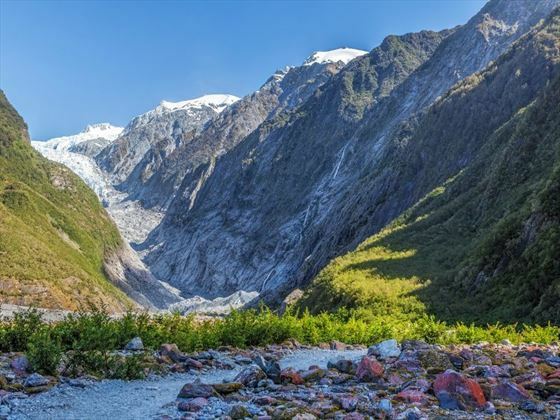 Upon arrival at Fox Glacier, admire the surrounding beauty of this incredible landscape – Franz Josef township and the glacier region is a further 45 minutes on from here. Drive north from Franz Josef to the historic gold mining region of Ross and Hokitika, where you’ll have the opportunity to explore the craft stores. Greymouth is the largest town on the West Coast and also serves as the starting point for the TranzAlpine scenic train. There are countless activities to enjoy in this region, from glow worm caving to white water rafting, horseback riding and cruising along the river. Just outside of Greymouth is the Shantytown Heritage Park which is a living monument to the gold mining era, including pioneer relics and historic buildings. 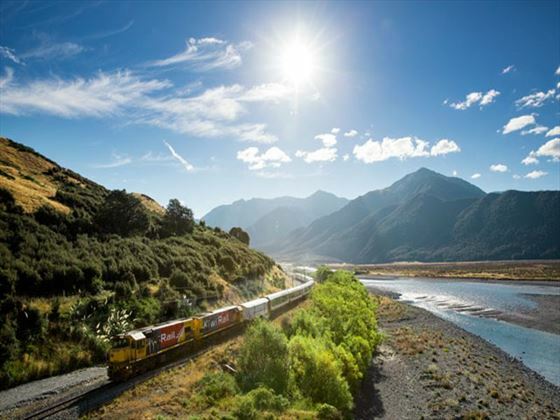 The TranzAlpine scenic train is considered one of the most spectacular train journeys in the world, taking you on an exciting and beautiful route from Greymouth to Christchurch. 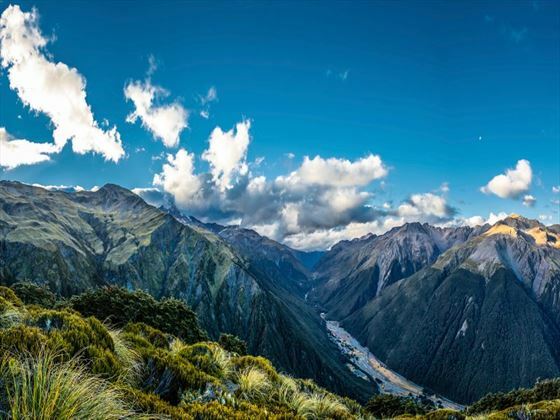 Making your way from the Tasman Sea you’ll venture through Arthur’s Pass National Park to reach the Pacific Ocean. Travel through the gorges, river valleys and forests to reach the Canterbury Plains before reaching Christchurch – your base for the night. You’ll be collected from the hotel this morning and transferred to Christchurch Airport where the tour comes to an end.